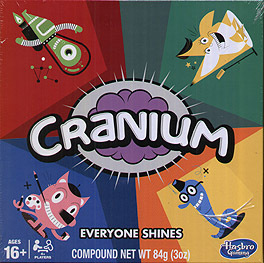 The CRANIUM game lets every player show off their talents! Creative Cat: Sketch, sculpt and draw stick-figure masterpieces, sometimes with your eyes closed. Star Performer: Act, hum and unleash your inner impersonator. Word Worm: Solve puzzles, define funny words, such as conscious, and enjoy a bit of word play. Agree with the other review - mainstream doesn't always mean rubbish! This is a decent party game and brings elements of charades, Pictionary, Balderdash, Dohdles etc in a fun little package. I still remember one of my family acting out an entire scene from Indiana Jones, giving it the full beans! Great fun. My favourite is the singing ones, as you get chance to do your best 'club singer style'! One drawback with the game is it doesn't suit introverts, you have to be a little creative although the game does allow you to choose a member of your team to do the particular task whatever it may be. Along with Wits & Wagers and Balderdash this is a party favourite in our house. This may be a mainstream game, but what's wrong with that? It is excellent as a party game. We've had it for ages and most of the folks we've played it with went out and got it very quickly. Huge fun! Some of the cards are a wee bit easy, but if you get the 1st Booster Box, you'll find they're harder and then you can add in those. It may be the best Party Game out. It's the best I've played, though Apples to Apples runs it close.